Hampton Downs owner Tony Quinn has confirmed the 4Guys Autobarn Legends of Bathurst will become an annual event to be held in January every year. The festival, celebrating all things Bathurst, concluded today with hundreds of fans turning up to meet their heroes and watch some classic cars in action. 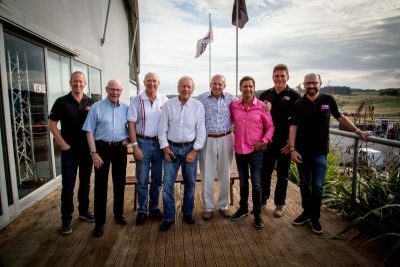 John Bowe was one of eight Legends of Bathurst — Jim Richards, Steve Richards, Allan Moffat, John Goss, Fred Gibson, Paul Radisich and Charlie O’Brien were the others — who did signing session for the fans over the weekend and entertained the crowd at last night’s dinner with their memories of Mt Panorama. Bowe teamed up with Garry Carter to win the feature race, the 20-lap Legends of Bathurst Invitational while Australian driver Charlie O’Brien once again dominated the Archibalds Historic Touring Cars category winning Race 2 & 3 in the Nissan Primera ST to make it a hat-trick of wins over the weekend. Hampton Downs owner Tony Quinn won the second Matos Formula Libre and NZ Sportscars race of the day ahead of the evergreen Kenny Smith who spun out on the last lap while leading the race. David Glasson won the first race of the day. Martin Lucas won Race 2 of the Historic Formula Ford category with Malcolm Oastler taking out Race 3. In the Enzed Central Muscle Cars category, Chris Boote won the first race of the day while Greg Honnor wrapped up the meeting by taking out Race 4.